The New Year is upon us and this day, as is American Tradition, requires of us a new resolution to improve on what we’ve managed to do with our lives so far. Though clichéd, I’ve always come up with one or two in hopes of bettering myself. Last year was a banner year though I really don’t remember what my resolutions were. To be truthful, I started out 2011 without much direction and the first five months showed that. My recovery was better than what I believed it should be, my relationship with God needed cultivation but was fair, my relationship with my wife needed a little tending to, as did my kids, business was “fair to Midland” and my workout routine was alright, if a little average… Now this is looking back. I’ve made so many strides (though probably not in the ideal order if I looked at it from a bean counter’s perspective) in the last seven months that it’s really skewed my perception. I’ve gotten a lot more done that I’d hoped I would, at least from January 1st, 2011. 1. I’ve gotten into a good rhythm with my wife in the last month or so and I’ve got to keep that going because it’s been a lot of fun. 3. I’m going to do a Metric and a Standard Century on my bike. Bob: What’s your resolution for this year Jim? Me: I’d like to keep the lines of communication open and expanding with my wife in hopes that we can parlay that into a fruitful, playful and enjoyable year. Me: I’m running a Tough Man this summer. In man talk, there’s no comparison, it’s not even CLOSE. Hell, most Americans can’t do one of those activities (Swim 1.3 Miles, Bike 56 and Run 13.1) let alone string all three together. It’s also easier, by a long shot. I view Tri’s as fun. I view training for a Tri as fun – I really do dig the working out and as long as I put the miles in, I’m going to do just fine and one way or another, we’re talking about putting one foot in front of the other and breathing. With the marriage, there are many more moving parts to juggle and the work is constant. I have to literally train my mind to perform better when it comes to dealing with my wife and kids, in real-time and throughout hectic, unpredictable and ever-changing scenarios… Hell, quitting drinking wasn’t that hard, or at least I was young enough that I had a singleness of purpose when I quit – that’s all I had to worry about because I had nothing else left. I’d drank everything into the gutter. And there’s one more thing; No pain. I’ve said it before, pain is my greatest motivator (or should I say, the desire to not experience mental anguish as the result of my own ineptitude or laziness?). How many men out there, show of hands, relish the silent treatment? I do to an extent… Oh, you’re not talking to me today? Sweet, I know you’re going to come around sooner or later, so that’s one less thing that I have to deal with today in one chaotic existence; my guys want more money, my customers want better service, neither are willing to help the other achieve their desired result so they expect me to magically make that appear out of thin air, I’ve got dead lines, headlines, we’re working on bread lines… the kids are sick, they’ve got gymnastics, we’ve gotta eat and pay the mortgage and taxes…and oh, yeah, throw a few meetings in there, and church… I have to fix that. Now honey, I know you’ll read this… This does not mean that you should aim for the goal of being the squeakiest wheel. I’ve got enough squeaky wheels as it is and I’m running low on WD-40. I’ve obviously got the idea, you’re number one, so chill out – please, for the love of God... A little help is good – what I don’t need, for the foreseeable future, is more cowbell. With that, it’s time to get rolling – it’s 36 degrees! 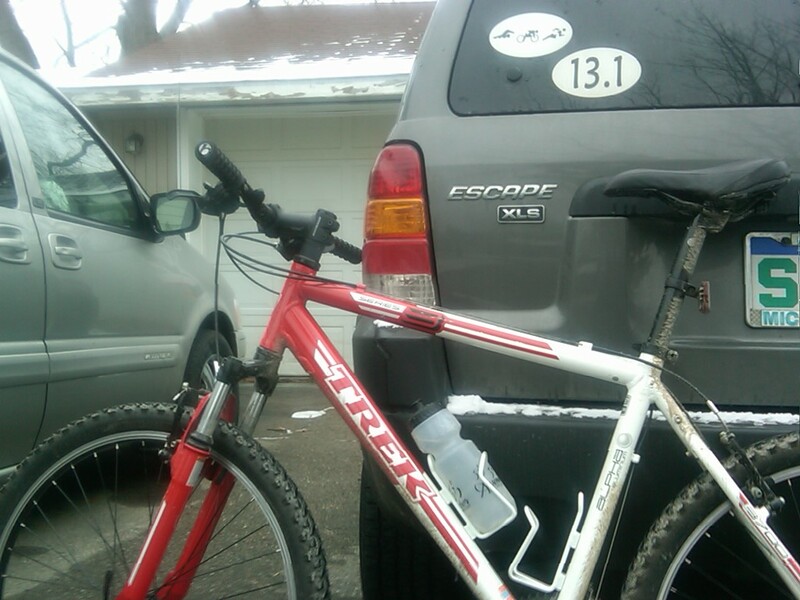 The rain washed the salt off of the road last night, so I get to ride down to the running club today! ON DECEMBER 31st! Riding a bike on a road is not quite as safe as say, walking the dog on a treadmill, but there are plenty of techniques that make it safer. First of all, we’ve got the road rage junkie. As an example, my wife and I were flipped the one fingered salute about a half a mile from our house on Christmas Day. There isn’t a whole lot you can do to please these people, most seem to me to simply be angry folks – especially seeing as we were single file, straddling the line on the side of the road with no cars in the opposite lane to block his passing us. I didn’t even notice to be honest, my wife pointed it out after he’d passed us. Beyond that, there are a few things we can do to make our trip safe. The most important, so far as I’ve seen, is riding with traffic. It seems counter intuitive to some, the idea being that you want to see traffic coming at you so you can react, like you would if you were running. In fact, while running, I always say, “if you see red, you’re dead” – meaning if you can see the red of the tail lights in your lane when you’re out running, you have a better chance of being hit than if you were on the left side of the road where you belong. The opposite is true for riding. First, when you’re running, it’s natural to move onto the gravel shoulder when cars are coming at you…pulling off the road onto the shoulder at 25 mph on a road bike is surely shy of suicide, but not by much. In truth, I actually know a couple of wrong way riders and, humorously enough, it’s darn near impossible to convince them that they’re wrong. With that said, the main problem with riding against traffic is cars that are turning right onto the road you’re on from your left… They’re looking away from where you’re coming from to see if they can pull out. If you’re coming from the left, they won’t see you before they drive into or over you. The same goes for riding on the sidewalk (sidewalk, not bike trail). Studies show that you’re three times more likely to crash when you ride against traffic (wrong way riders account for 8% of riders and 25% of all crashes). Getting rear-ended, driving with traffic only accounts for 4% of crashes. Think about that – 92% of riders ride the proper way in traffic, actually, take another 2% off for sidewalk riders, so 90% of riders and only 4% of all accidents involve a rider getting rear-ended. UPDATE: I got to thinking, I can add to this post in a semi-significant way… Part of my normal daily ride includes riding on one of the busiest roads in my County. It has bike paths on both sides but it’s pretty hectic with traffic turning onto the road. The speed limit on the stretch that I ride is 30 to 40 mph… When I can, I use the cars in the lane next to me to block for me going through intersections. If I see a car to my right up ahead looking to turn onto the road, I’ll pick up my pace to keep up with a car driving next to me. The assumption is that while I’m tiny compared to a car, most people will refrain from turning into oncoming traffic. I’ll still look at the turning driver’s face and eyes as I approach to make sure they see me, but I’ve never had even so much as a close call with a car next to me – the same cannot be said when I’m alone…and the technique works as its own interval. I was averse to clip-less pedals when I started putting in more serious miles. I’d seen one friend come back with one side of his leg and arm scraped up pretty severely and another with her leg pretty messed up after an endo, both attributed the wrecks to not being used to their feet being locked into their pedals on the first attempt. I’m not a chicken, but I don’t mess around either when it comes to being as safe as possible on my bikes as I’ve got a wife and kids to provide for. In a nut shell, I have to maintain a balance between safety and adrenaline seeking and this balance will differ from person to person. I won’t be mountain biking on the side of a cliff, at least till the kids are out of college, on the other hand simply riding in traffic is a lot more dangerous than being a couch jockey. Of course, the argument is, being a couch jockey is just as unhealthy as riding in traffic – and therein lies the balance. 1. On trails, when you’re going fast down a bumpy hill, your feet won’t bounce off of the pedals (see also item 4). 2. Again on trails, on the steeper climbs, they improve balance and allow both legs to work at the same time – I wouldn’t be caught dead without clip-less pedals on a trail anymore. 3. On the road they allow me to round out my stroke (though there is research that showed negative pressure on the upstroke – meaning the front leg still tends to push the back leg up, even in the pros). In other words, I don’t feel like I’m mashing the pedals on the down stroke which is typical with standard pedals. 5. I feel more connected to the bike – though this took some getting used to. I was more into jumping and dragging my foot for balance around tight corners when I was a kid. I didn’t have to rely on knowing the limits of my bike. If it started to slip, I could just put more pressure on the drag foot. To sum the clip-less pedal discussion up, now that I know what I’m doing on the bike with them, I wouldn’t want to live without them – in fact, I paid extra so I could get the dual purpose pedals for my mountain bike and I’ve only ever used the standard pedal side one time. Riding clipped in, in my opinion, balances out as safer in the long run – the benefits outweigh the negatives. By the way, speaking of only road riding, if you’ve never been mountain biking on real trails, you’re missing out. Playing in the dirt is FUN! A little more intensive on the clean up, but it’s a great workout. Remember your clear safety glasses though – you will catch a branch in the face and sunglasses are too dark in the woods. If the front of your knee(s) hurts, raise your saddle. If the back of your knee(s) hurts, lower it. About three months ago I started experiencing some knee pain after I had my Cannondale worked on – tune up, stem raised, simple stuff. A week later, with a serious mileage increase, my left knee started hurting (in front). I remembered reading the tip so I raised my seat about 1/4″… Sure enough, the pain stopped within a day or two and never came back. Of course, it should be stated, if you’re new to biking, buy a bike that is fitted to you by a pro. They’ll take things into account that, as a rookie, you won’t know about. How to Make Your Mountain Bike Fast… Really. On a budget. December 28, 2011 3:13 am / 16 Comments on How to Make Your Mountain Bike Fast… Really. On a budget. To begin, let’s keep this simple. If you have enough money to walk into your local bike shop and buy a mountain bike and a road bike, stop reading. Don’t waste your time or your money – you’ll be happier with two bikes. Also, if you want to rocket down the flats at 35 mph on your mountain bike, it isn’t going to happen. 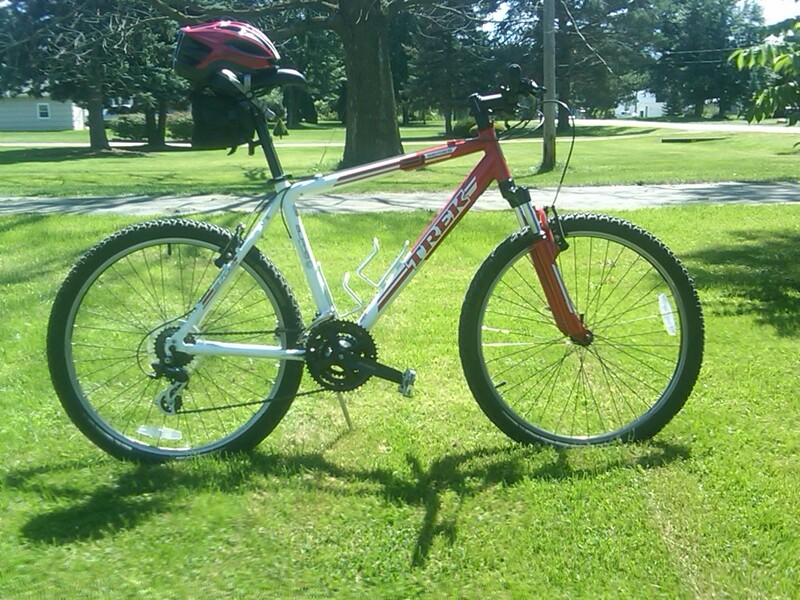 Mountain bikes are too heavy and the front suspension will rob you of power that is normally transferred to the crank. On top of that the chain rings are smaller for climbing, rather than speed and mountain bikes are not aerodynamic. Period. It’s physics and it’s the law. Not liking it won’t change it. 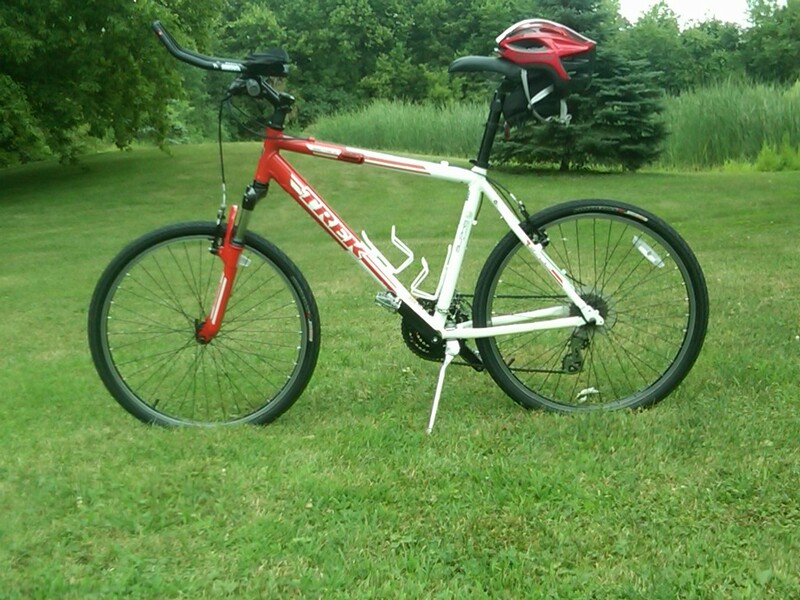 With that in mind, I built my Trek 3700 (which I bought used for $100) into a heavy weight screamer with less than $400 – including the price of the bike. Now that’s not all of the cost involved in biking, this is not a cheap sport unless you just want a decent workout or to tool about town. When you go to implement some of these changes, search the procedures out on the web so you don’t break your bike (or you) in the process. Start simply and cheaply with the tires, which will give you the greatest increase in speed because of the decrease in rolling resistance. Knobby tires rob you of speed, start with a nice 26” pair of road tires for a mountain bike, they’re thin enough to race on but thick enough that you won’t kill yourself on a shoulder or dirt road – and they’re less than $30 each. Next, if your mountain bike has a 40 degree rise on the stem as mine did (the part that holds the handlebar), lose it for a ten or seven degree rise ($30 – $70). Mine is a 10 degree, flipped upside down. Also, if you have a 25.4 mm handle bar, this would be a good time to upgrade that to a 31.8 ($20-$40) – make sure you get the proper stem with the bar, though this won’t be difficult as bike shops rarely carry the 25.4 stems any more. This will drop your handle bar down by an inch or two so you can add aero bars ($115-$135). The aero bars, next to the tires, will gain you the most speed. Make sure your saddle is the right height for you, then adjust your stem so it’s a couple of inches lower than your seat. You can do this by juggling the spacers around (for those with Direct Connect stems). Let’s see, a decent Craigslist bike, some bolt on parts and you’re well on your way at a grand total of $265 – and all of the components that are linked are very decent. Now, if you’re going to buy your bike at an online auction site or on a garage sale website (like Craigslist) and you want a Trek, Specialized, Scott or Cannondale mountain bike for $100 or slightly more, it will take patience (usually), persistence and luck – and you will likely have to deal with a rusted chain, a dirty cassette, rusted control wires, dings and scratches or any number of issues. Most are cheap and easy fixes – Google is your friend, use it wisely to learn how to complete the repairs. Point is, most are between $150 and $350 so finding the really good deal takes some work, but beware: Don’t buy a nice bike that someone beat the hell out of. A poorly cared for bike can be a money pit. Take it for a ride before you pay… Check to make sure the crank isn’t bent, make sure the chain rings track straight as you pedal, no nasty noises etc. Next up you get into the technical stuff (stuff, by the way, you would have had to add to your brand new $1,000 road bike anyway). 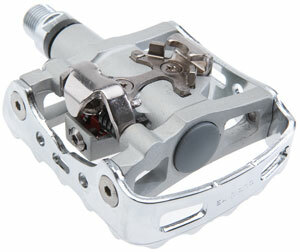 Get rid of your stock pedals and trade up for the clip-less model (if you don’t want to fully give up your pedals – I didn’t – Shimano makes a dual pedal for around $85) and the mountain bike shoes to go with them ($90 – $120). Truthfully, the pedal upgrade should be done if you’re going to ride on trails too – I wouldn’t go near a trail without them (I’ll get into that another day). Get the mountain bike shoes too, not the road shoes… The mtb shoes have treads so you won’t be walking on hard plastic (or carbon) and steel as you would if you bought road bike shoes. Pedals and shoes will do wonders for your speed as well… We’re up to $420 – still under the price of a brand new high-end entry-level mountain bike. Throw in a helmet ($40), air pump ($30), gloves ($20), glasses ($30), water bottles and cages (2 ea. @ $25 total), a small bag to carry everything in ($20), new cables and some chain oil (use the new “dry” stuff) <$15, shorts ($60), jersey ($80) and, you’re ready. For less than the price of an entry-level road bike – and when you want to go out on the trails you can pull off the aero bars in 2 minutes and change the tires in 10 minutes and switch the spacers on your stem to raise your bar in another 5 minutes (with only 2 Allen wrenches, an air pump and tire tools)… You can hit the trails, and ride fast, with one bike, for under $750 if you work at it. By the way, and this is important. If you are reading this, you are not a purist and may not be too adept at bicycle maintenance and repair (I wasn’t)… Buy everything you can at your local bike shop. If you buy your equipment there and they get to know your face they will help you with issues that perplex you. There is one technical item that I skipped over but I’m told can be done – the question is, at what cost; a new crank with bigger chain rings. In the end, I “geared out”, I couldn’t pedal fast enough in the top gear to go any faster, topping out at a little more than 40 mph going downhill. Switching the crank out to solve the problem is not a cheap thing. Depending on the setup on the bike, you may have to buy a new derailleur in addition to the crank… At that point, I just bit the bullet and bought a road bike. Now I can get to 35 on the flat (though not for more than a couple of miles) and I’ve been faster than 50, simply impossible with my old setup. Now this is the problem with trying to make a mountain bike do something it isn’t meant to; all told, I’ve got about $1,200 into my two bikes used bikes at this point (and this includes items that I’d have bought whether I picked up brand new bikes or gone with used)… I’ve got a mountain bike that fits great and a road bike that I absolutely love but is a touch too small. I’m going to hang on to the mountain bike, but I’ll be upgrading the road bike as soon as humanly possible because the down tube shifters are terrible and upgrading them to STI while possible for a seven speed, the cheaper option is not perfect and the idea is to shift correctly all the time and I don’t want to have to buy a new rear wheel, cassette, spread the back-end and everything else that has to be done to make it right. So I’ll keep my old school as a back up (or a travel bike for vacations) and get into decent racing bike as soon as I can… After all that money, I’m going to end up buying a new $1,500 road bike anyway. Of course, when I started out in cycling, I just wanted to run a couple of triathlons – I had no idea that I’d like cycling as much as I do, so there’s that. The point is, if you really want to assign a mountain bike to dual purpose, within reason, it is possible even on a budget. Just be sure to think it through so you don’t waste more money than it’s worth. UPDATE: Changed a few grammatical errors… Note to self, don’t post late in the evening. 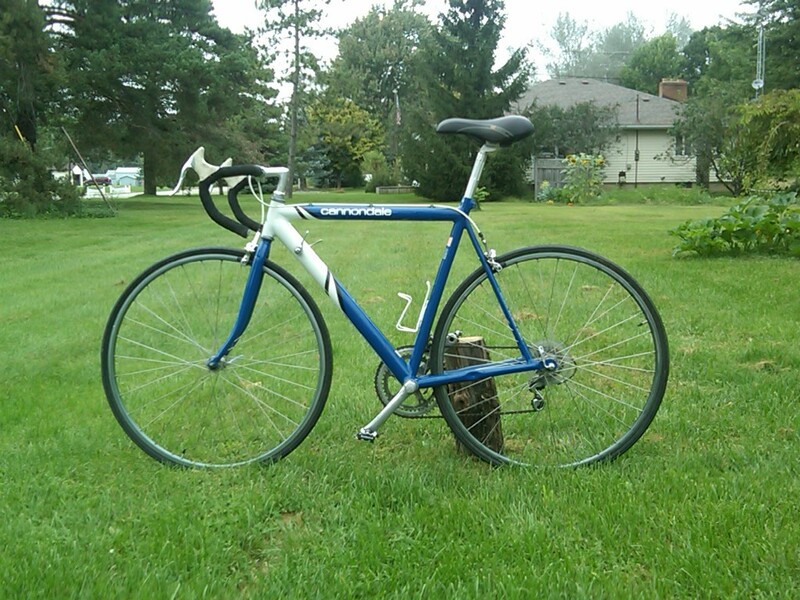 My bikes were both purchased used, my Trek 3700 Mountain Bike from a good friend in our running club, my 1990 Cannondale Criterium SR400 Road Bike from Craigslist. Everything else that I own for biking came from Assenmacher’s Cycling Center, and with the exception of my pedals, I look a little like Frankenstein on my bikes. 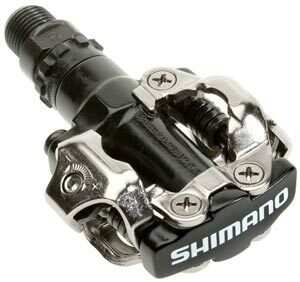 For my mountain bike I’ve got Shimano PD-M324 dual purpose pedals – they’re clip-less on one side and have a cage on the other so I don’t have to worry about being caught shoeless. For my road bike, I’ve got the PD-M520 two-sided clip-less pedals. Both work as they should. My jacket, gloves, helmet and shoes are all from Specialized. In fact, I’ll probably just buy a Specialized road bike when I upgrade just so I can have everything match for once. Whatever I end up deciding on, I can guarantee you that I’ll be buying it from Assenmacher’s, and will gladly let Matt, the owner, size me up. To label him a guru would be to do him an injustice. Strangely enough, as much as he does know about bikes, that’s not exactly the reason I shop at his stores. I shop there for the enthusiasm in service. In short, he doesn’t try to sell me stuff that I don’t need but he’ll let me know if I need to shoot a little higher on the important items. When it came to apparel, however, I divorced myself from my tendency to buy good but cheap equipment. I hate winter for exercise, if I had my way I’d move to a warmer clime or sit it out for a couple of months (in fact I did sit it out for the most part last winter), so I didn’t mess around when it came to my jacket, gloves, hat and shirts. I did go cheap for my sweet pants – my wife picked them up at Old Navy or something for less than $20 a pair. They’re perfect for temps down to about 40 and for foul weather I’ve got a pair of fleece long johns that fit under them perfectly, that combo is good down to about 10 degrees, and I can promise you, if it’s that cold outside, I’m spinning in my office. For the jacket, I’ve got the Specialized Element jack et. This is the perfect cold weather jacket. It’s got plenty of pockets and I haven’t met a temperature that I haven’t been comfortable in yet. In fact, I’m such a fan of this jacket that I run in it too… I don’t have to bother with three or four layers any more when I’m running in the snow. In fact, it was 26 degrees with a 15 mph wind the other day, I wore this jacket and one of those long sleeve under armor shirts and a light long sleeve under the jacket and was actually a little too warm. Yesterday I went for a ride with the wife with just a long sleeve running shirt and the jacket and it was perfect (34 degrees). I can’t say enough good about this jacket. It is truly awesome. For my gloves, I stuck with Specialized and got the BG Deflect. Again, these are great to wear running too, although they aren’t as thick as the material in the jacket (and no liner) so they’re just a touch cool. 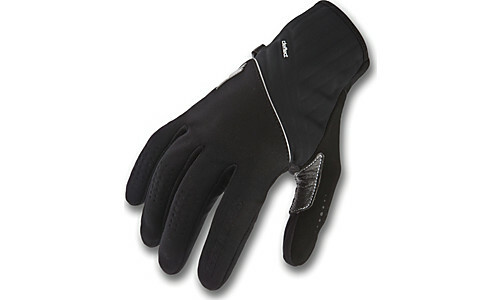 I’ve thought of wearing a cheap yarn running glove under them but haven’t found that necessary yet… The padding on the palm is great for road bike riding, but leaves a little to be desired on a mountain bike. Of course, this is mainly because I don’t have any natural padding on my hands. So take that little critique with a grain of salt. 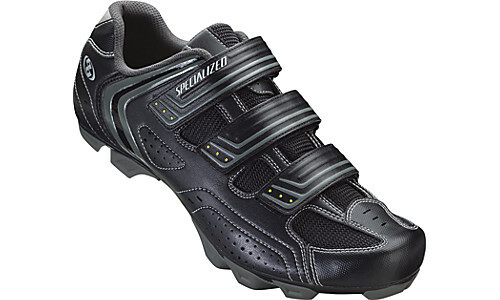 For my shoes, I had a tough choice to make… Go with the standard road pedals and a second set of shoes (and another $100-$150) or just go with the clip-less pedals on my road bike and use my MTB shoes. I opted for the latter. 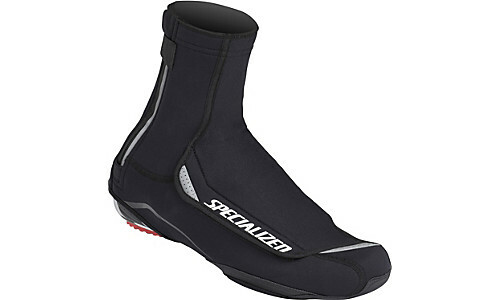 I bought the budget line Specialized Sport MTB shoes but they work just fine, though I will say this: I need the Shoe Covers that go over my shoes (and I haven’t picked them up yet)… The shoes are so adept at letting air in to circulate that wool socks aren’t enough to keep my feet warm. I had planned on riding the road bike down to the running club from what I’d seen of the weather reports on Friday night. I was bummed to see this when the sun finally came up. It was supposed to be mostly sunny and in the mid 30’s… It was cloudy, windy, in the mid 20’s and had snowed a touch on Friday night making the roads a little gnarly. Not to worry, dusted off the mountain bike and took the back roads. Followed that up with an attempt at my fastest 5k ever, which didn’t turn out too well. The first mile was awesome, a 7:20, but the wheels fell off after that (too much zone 5), trying to push too hard. My second mile was an 8:00 and I ended up walking the last mile back, completely gassed and cramping. The snow melted on the dirt roads creating a nice slick mush. I was covered head to toe in mud. Generally, I’m not the mud puddle kind of guy, but every now and again (usually when I’m out in the middle of it and can’t do anything about it anyway), I like to embrace the muck… So Saturday was a 26 mile day. I followed that with a nice 8 miler with my lovely wife on Christmas day and then a nice 13 today in the sunshine… The temperature was even reasonable today – currently a balmy 40 degrees! Welcome to Michigan, it’s sure to be cold when you expect it to be warm (I was golfing in the snow in May up in Gaylord this spring) and warm when you expect it to be cold. Better than sitting on the couch, that’s for sure – what a great weekend.